Ohmic’s Ultrasound Power Meter, Model UPM-30, is designed to measure the ultrasonic power output of diagnostic or therapeutic transducers up to 30 watts using the radiation force balance method. The UPM-30 consists of a precision mechanical balance which measures from 0.01 to 10.00 grams, a conical target suspended on a hanger, a water tank, a transducer support rod with clamp, and a carrying case. The transducer to be tested is center mounted over the conical target with the transducer’s radiating area immersed face down in the water medium. Model UPM-30 determines the average ultrasonic power by measuring the radiant force exerted by the transducer on the conical target. This target is coupled to the precision mechanical balance which is used to measure the gram-mechanical force due to the ultrasonic radiation. The gram force is directly proportional to the ultrasound power in watts when multiplied by a constant of 14.65; therefore, a 2.05 gram force would be equal to 30 watts of ultrasound radiation. The heart of the UPM-30 unit is its air-filled conical target. The weight of this target is nulled to a minimum by using its own buoyancy. Ultrasound energy is mechanically transferred from the target to the precision balance where it is measured. Reflected ultrasound energy is absorbed by closed-cell butyl rubber walls inside the water test tank. 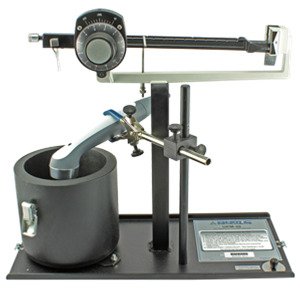 This system provides a sturdy instrument with good measurement accuracy and economical cost.